An amazingly big car. I do seriously wonder about the scale with this thing. There were two versions - this in gold and black and another in blue. They are impossible to play with as they don’t go round corners at all well. There is some TV affair inside that should run off a battery in a compartment underneath. This one is complete but has just one TV screen and may need a new bulb as the light isn’t working. It comes from a friend’s collection and he has had it since new. 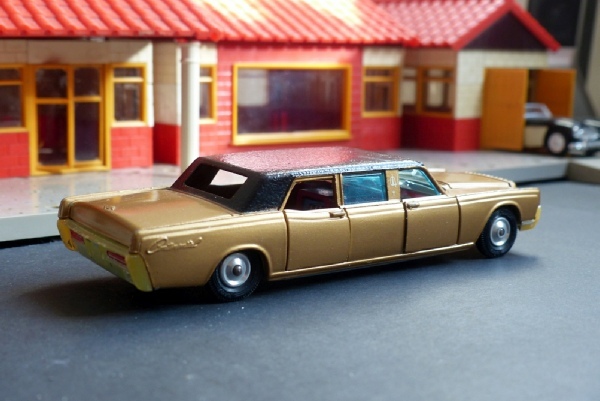 The gold paintwork and black roof are very good but the chrome has been lost on the bumpers. That isn’t too obvious because it it white plastic beneath. Both headlamp units are in place. The suspension is poor at the back and the front doors seem difficult to close neatly. The wheels and tyres and screens are all excellent and nice and clean. It also has the original inner display section, but not the outer box. That has an original and very clean instruction sheet which is probably worth as much as the car!